In previous posts, we looked at how praying is "scary" and "easy." Prayer is easy because any child can do it, and praying can be scary because it forces us to be vulnerable before God and others. When you put the simplicity of prayer together with the fear it often induces, you end up experiencing the great challenge of prayer: it is something that should be easy, but isn't. Since it is so easy, it shouldn't be scary, but it is. These tensions and conflicts lie within prayer itself. We are sinful creatures, weak creatures, crying out to a Holy God, an all-powerful God. We need to draw near to God, it is our joy to draw near. And yet, we all, like Adam and Eve, hide from him, and we all, like the prodigal son, run from him as well. Sometimes, trying to draw near to God in prayer feels like trying to push together the ends of two magnets with the same polarity. I have a friend whose will-power is legendary. He seems to be able to make himself do literally anything. As a result, he is able to work long hours and manage many complex areas of responsibility outside of work as well. (I often envy this ability!) But there are two things that he cannot consistently make himself do by his own will: pray daily and get his family to church on time. He actually does both of these things rather well, in my opinion, but for him, these are the two most difficult tasks in his life. Why is this? Have you ever felt this way: that praying, though so simple, seems like the most difficult thing in the world to do? I know I have. Why is it a battle to pray? We can't see God. The most obvious reason that prayer is difficult is because we are having a conversation with Someone whom we can't see, and who does not talk back to us very often (at least not in an audible voice). This makes prayer a kind of talking unlike any other. And just as it takes doctors years to adapt to talking in medical terms, and just as it takes children years to understand how to talk on the phone, so talking in this manner (to One unseen) takes time and practice. If we never talk to God, we'll never learn how. Relational focus is more difficult than other kinds. Regardless of who we are talking to, the relational focus required for conversation takes energy. This is doubly true of a conversation with God, one that is outside the normal way we talk with people. But, just like other areas of life, this capacity in us can be strengthened with use, by God's grace. Martin Luther, for example, would pray for hours a day, even with his busy schedule (he managed 11 monasteries, pastored a church, wrote copious amounts of material, and taught university classes). Monks and many other modern day mystics (some of whom are just normal people like you and me) can spend hours in prayer as well. Unseen spiritual forces work against us. I can't prove it, but it seems like something unseens is working against me when I pray. I can wake up at 5am to go to an appointment, I can wake up at 5am to read… even to read the Bible. But when it comes to waking up to pray: the snooze button seems glued to my fingers, and the bed more comfortable than ever. 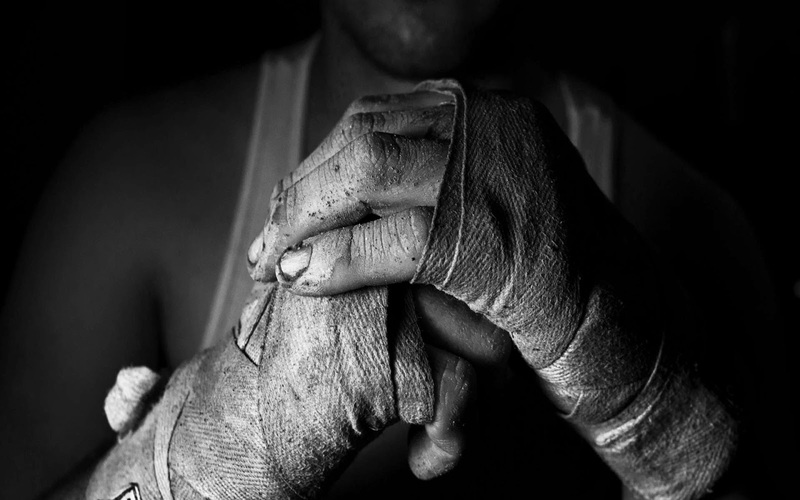 Often, even when I get to my place of prayer, I find it a battle to focus. While I have a few "tricks up my sleeve" to help me focus (ask me if you'd like to know), I believe there are unseen spiritual forces at work trying to keep me from prayer. Many many other Christians I know have felt this same thing. We sin. Because we have a sinful nature in us, we sin. These sins are often "things left undone," including prayer. It is a sin to live a life of prayerlessness. Given these things: how can we win the battle? How can we become people "of prayer"? Here's a few short principles that help me. Be confident in God's powerful help. One of my life-verses goes like this: "Therefore, my dear friends, as you have always obeyed—not only in my presence, but now much more in my absence—continue to work out your salvation with fear and trembling, for it is God who works in you to will and to act according to his good purpose." (Philippians 2:12–13) The ONLY hope we have to obey Him is His POWER working in us. ""I am the vine; you are the branches. If a man remains in me and I in him, he will bear much fruit; apart from me you can do nothing." (John 15:5–6) (See also Galatians 5:16ff; Col 1:28-29; Ps 32:8-9; 2 Pe 1:3). And Jesus is the ONLY hope we have an against any unseens spiritual forces that work against us in times of prayer. "You, dear children, are from God and have overcome them, because the one who is in you is greater than the one who is in the world." (1 John 4:4) See also Ephesians 6:10ff for a great study on this! Giving to the poor and those in need is probably the most overlooked historic Lenten discipline. This, despite the fact that the appointed Scriptures for Ash Wednesday clearly tell us otherwise: "Is not this the fast that I choose: to loose the bonds of wickedness, to undo the straps of the yoke, to let the oppressed go free, and to break every yoke? Is it not to share your bread with the hungry and bring the homeless poor into your house; when you see the naked, to cover him, and not to hide yourself from your own flesh?" (Isaiah 58:6–7) Here we see, yet again, that much of what God calls us to in Lent is really just the normal Christian life. These are things we should be about year round: prayer, the Word, fasting and caring for the poor and oppressed. (Let me recommend you read the book of Amos in the Old Testament to drive this point home, or perhaps Luke 6:20-49). I have been praying for some time that the Lord would give me opportunity to help those in need, and I think God gave me one avenue to help this Lent.... and I want to share it with you. You may know that for the past several years our family has been in partnership with a Pastor in Pakistan, Asif Raza. Over this time we have supported his ministry in a mostly Muslim region and have seen a tremendous amount of fruit. • A vocational training center for widows. Each woman enrolled can learn to become a seamstress and receive a quality sewing machine upon graduation. The Gospel is preached daily during the opening of class and many widows have professed faith and been baptized. • A Christian school. Children attending the True Vine English Medium School receive a quality education, including foundational Biblical studies. Pastor Raza has also opened the doors to over 50 orphans from the area. These children can receive education and frequently receive lunch – sometimes their only meal of the day – through the school. Widows in the vocational school training center make uniforms for the school children as part of their project work. • A small dairy farm. This is one of many ways Pastor Raza has been diligent over the past few years in seeking ways to raise his own support. Soon he will also have chickens on the farm. He is never idle! Until now, our family and a few others have supported this ministry with our own tithes and offerings. As God has blessed this ministry, it is continuing to grow and experience new needs that are beyond our financial capacity. This is why I’m writing today. 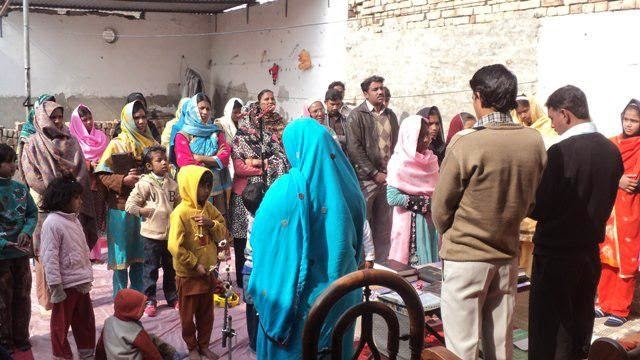 Pastor Raza asked if we would stand with him in prayer, believing for the finances to purchase some machinery and materials that will enable widows from the training center to begin selling their own items. I wanted to go a step beyond praying for this request and cast the nets out to you, our believing friends and family. Would you consider partnering with us in this, both prayerfully and financially? US Dollars go a long way in Pakistan. For about $600, we can supply most of the machines and materials these widows need to begin generating their own support through a small local business. What the $600 doesn't cover has been donated by several of the widows in the training center, who have agreed to forego the award of a sewing machine – which is normally given to every woman who completes the training curriculum! Their willingness to sacrifice when they have so little to begin with has touched our family deeply. As such, Amy and I have agreed to match donations to this project up to the $600 goal. Our family has created a 501(c)3 educational charity to support this cause, so donations are tax-deductible. 100% of donations go directly to support Pastor Raza and his ministry. Following are some pictures of the widows at the Sewing Center, the children at the True Vine School, and of Pastor Raza and Daud (an associate pastor who is in Bible School) working together. Looking forward to working with you for Kingdom growth! But the definition of prayer I gave above has some merit to it. Though prayer is a serious endeavor whose gravity we can never quite appreciate, it is also meant to be a normal, every day activity… and even an every moment activity. The Scriptures tell us to “pray chronically.” (1 Thessalonians 5:17) And many Christians throughout history have talked about “praying as you go” and "practicing the presence of God," ways of praying throughout the whole day, moment by moment. So, if prayer is meant to be done throughout the day and if we are meant to pray often, then we must not expect every prayer to be an experience of the glory of God on par with the Transfiguration. Prayer, in this sense, can be very ordinary and easy. The ineffable God is also the gracious God who loves his creatures and hears their prayers. Yes, prayer is a profound mystery, but because God is gracious, even a child can pray. And if it is that easy, then even I can do it… and so can you. How then shall we pray? In light of the ordinariness of prayer, I want to offer in this article just a few suggestions for very easy and practical ways to pray. This isn’t an exhaustive list, but these are some of the easiest ways I’ve discovered. And I think you’ll find that even though these simple ways to pray are straight-forward, it will take some tenacity to live them out daily. Any of these can be done alone, or with your spouse, roommates, or family. I recommend picking one, then doing it for two weeks before moving onto another. 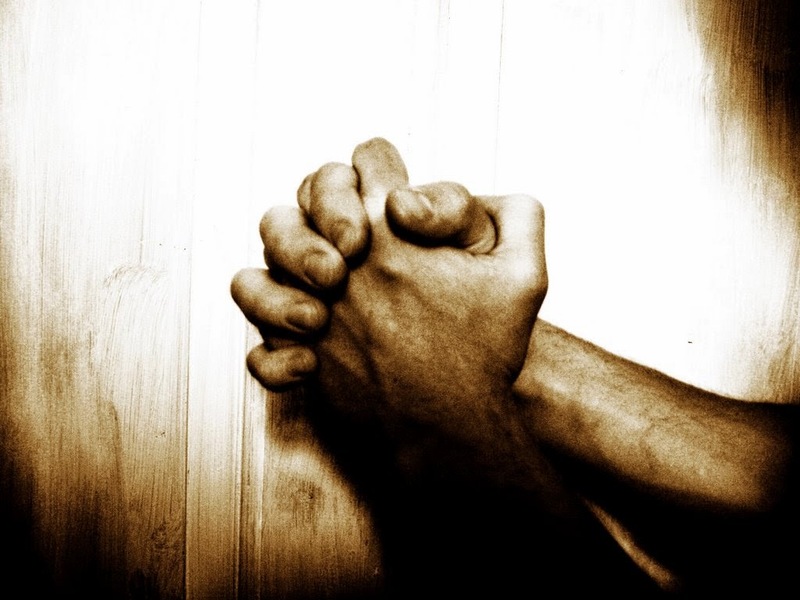 Pray the Lord’s Prayer - Don’t you ever wish you could ask God Himself how we're supposed to pray? Well, that’s exactly what Jesus’s disciples did! The disciples asked Jesus in Luke 11:1 - “Lord, teach us to pray, as John taught his disciples.” Jesus answered their question by giving us the prayer known as “The Lord’s Prayer.” You can pray the Lord’s Prayer in two ways: 1) You can pray it word for word. This is the most common way Christians pray the Lord’s Prayer. If you do this, you can add your own personal requests before or after you pray the Lord’s Prayer. 2) You can also use the Lord’s Prayer as a template for prayer. So, for the first line, you would say the prayer: “Our Father, who art in heaven, hallowed be thy Name…” and then you would add your own personal prayers to this line, prayers consistent with the theme of that line, prayers of worship (e.g., “God, I praise You because You made this world beautiful and because You are the source of all beauty!”) When you get to the line that says “Give us this day our daily bread,” you can then pray for every and any need you may have. After you go through each line of the prayer, adding your own prayers between each line, you’re done. Pray the “Jesus Prayer” - The Jesus Prayer is a short prayer that can be said at any time throughout the day to call out for God’s help, to confess sins or to remind us of God’s caring and holy presence throughout the day. The prayer goes like this: “Lord Jesus Christ, Son of God, have mercy on me, the sinner.” This prayer comes from Luke 18:10-14, the parable of the Pharisee and the tax collector. You can write this pray on a note card, and pull out the card throughout your day and pray this prayer. Once you’ve got this short prayer memorized, you can say it throughout the day whenever you need to call on God’s help, be reminded of his presence, find yourself battling with sin, etc. Saying the Jesus Prayer is a great way to start your prayer times throughout the day: you can pray the Jesus Prayer, and then add your own personal prayers after it. Pray the Scripture - This, I think, is something every Christian should learn to do. To pray the Scripture, we read part of it out loud, then we respond to God’s Word by praying “back” to God, what his Scripture just said. So, for example, you could read Psalm 13:1 “How long O Lord, will you forget me forever?” And then pray to God: “Lord, there are times I feel like you don’t hear. Please stay near. Please help me.” Then you would read the next line of the psalm and continue on. You could also pray Ephesians 2:1 “For you were dead in your transgression and sins…” And then pray: “God, thank you, that even though I was dead in sin, you’ve made me alive. Father, I am amazed that you can make dead things live, that you can make life out of nothing!” Praying the Scripture is another way that God teaches us how to pray, and in addition to that, when we pray the Scripture we are learning God’s Word as well! Pray the Hours - The Book of Psalms describes prayer and praise to God happening at fixed times throughout the day. Morning, noon, evening, sundown, and even at midnight. It appears that throughout OT history and throughout the history of the Church, God’s People would set aside set times during their day to stop and pray. This is called “praying the hours." In the Anglican Church, it is common to do this four times a day: morning, noon, evening, and before going to sleep. If you’ve never prayed the hours, a great place to start is the prayers for individuals and families on pp. 136-140 of the Book of Common Prayer (1979). Pray A.C.T.S - A.C.T.S. is an acrostic: each letter stands for something. A is for adoration: a prayer that praises God for who He is (e.g., “God, you are holy and powerful and loving.”) C is for confession, a prayer where we confess our sins to God. (e.g., “God, please forgive me for ____.”) T is for thanksgiving: a prayer where we thank God for what he has done. (e.g., “God, thank you for saving me, for giving me life, for my job, etc.”) S is for supplication, which is a fancy word for ‘asking.’ In these prayers, we ask God for whatever we need. Praying through the ACTS acrostic is a helpful way to keep our prayer life from being one-dimensional, merely a list of things we want. 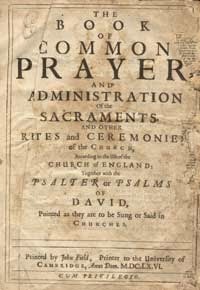 The Book of Common Prayer (1979) - Particularly the prayers for family devotions (pp. 136-140), and the daily office prayers (pp. 75-135). You can access online for free. The Prayer of Jesus by Hank Hanegraaf - Hanegraaf is a bit snarky, but this book on the Lord’s Prayer offers some great correctives to our culture’s obsession with prayer as a means to get what I want. Prayer by Richard Foster - While I can’t endorse this book whole-heartedly (Foster’s hyper-individualistic framework makes his view of spiritual disciplines a bit off), he is an expert on many many ways of praying. His book is helpful. The Valley of Vision - This is collection of Puritan prayers that model the depths that prayers can have.